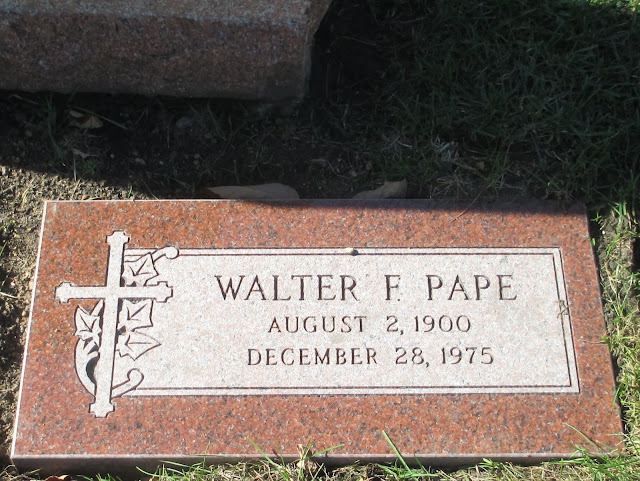 This past summer, my second cousins Kim, Debby, Val, Claudia, Beverly and I worked together to get gravestones made for their grandmother and our great aunt(s) and great uncle. They were all buried in the Pape family plot at St. Henry Catholic Cemetery in Chicago, but for a variety of reasons, never had markers placed. 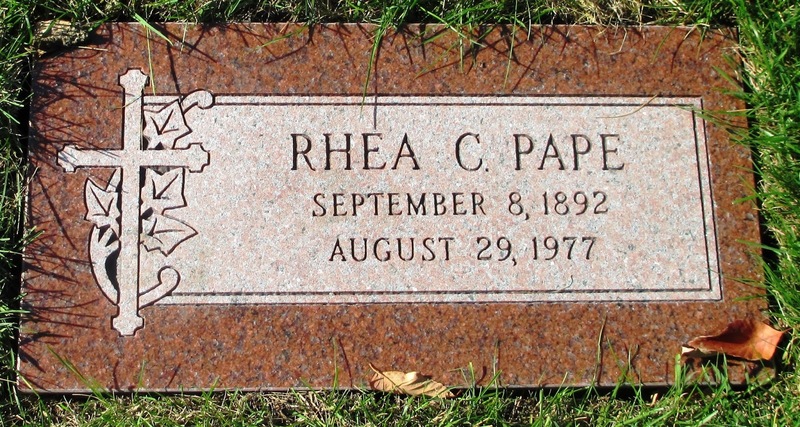 My cousins wanted to do one for their grandmother, Maria "Rhea" Gertrude Cecilia Pape (1892-1977), as well as our great aunt Clara Martha Pape (1889-1975), who was close to Rhea. 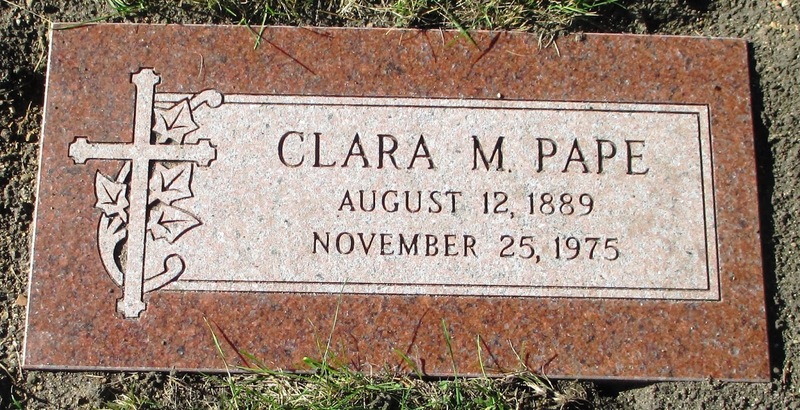 I decided to purchase the marker for our great uncle Walter Francis Pape (1900-1975), who, like Clara, did not have any children. 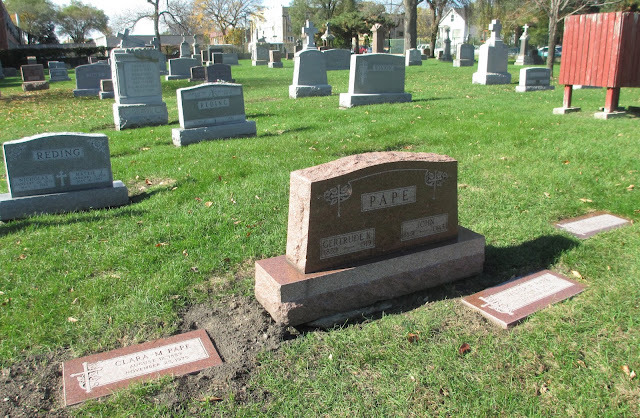 In the end, we all went in together for the stones, which were designed by Gast Monuments to coordinate with that of their parents, John Pape (1851-1945) and Gertrude Kramer Pape (1859-1919). The stones were installed by the end of October, and the following month, on a beautiful day, my friend Amy Windler got the following photos for me. The first shows the stones in reference to John's and Gertrude's upright marker, with Clara to the left, Walter just in front, and Rhea to the far right. We are going to inquire about moving Walter's stone to be located between John and Rhea. © Amanda Pape - 2016 - click here to e-mail me.